Having a light maple cabinets in your kitchen can help you in terms of creating a bright and energetic place for you to be. The maple cabinets typically come with light, or blonde color that can provide you with a neutral starting point of either warm and cool tones that can complement each other nicely. As for house owners, who have gold-brown tones for their kitchen counters, it is recommended that you combine it with rich and earthy colors. In order to maintain the tone present in your kitchen, you need a suitable complementary of paint color that can contribute enough feeling of warmth to you and your family whenever you are in the area. First thing that you need to do is to select suitable colors that fall under the warm side of the Color Wheel. For example, the warm color that you can choose includes yellow, red and orange. All of these vivid colors can you in preventing your maple cabinets look drab or washed out. Blue and green falls under the category of cool colors. You can look for the Color Wheel whenever you visit your local hardware store at the paint section or you can even consult the employee who works at the section. In order to make your kitchen room look much brighter, you need to consider using a light shade. For example, you can make use of the yellow-gold shades that can open up your kitchen and to complement the color, you can use gold tones for your kitchen counters. Another combination of colors that you can choose includes a bright, sunny, lemon-yellow or a gold shade or even color between amber and yellow. You can also choose light green which function just like light yellow because the colors are capable of brightening and energizing your kitchen room and making the room look bigger. Green color also provides color, shade and contrast especially if you use lime green. You can also paint your kitchen using warm and earthy tones. Some of the colors shades that falls under this category are terracotta or nutmeg. You can use red-brown undertones that should be able to complement maple cabinets along with gold-brown counter tops. If you like darker shade, make sure to choose warm and rich brown colors that can look attractive alongside your existing maple cabinetry. You can also make use of darker chocolate and cinnamon shades which is suitable for all of your kitchen walls as well as on one accent wall of your kitchen. 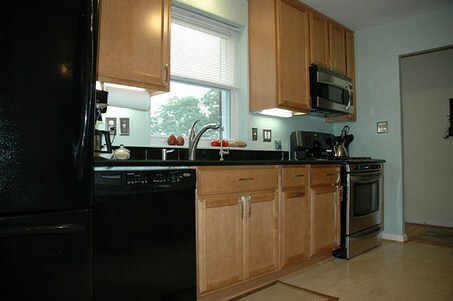 You can also add accent freshness feel into the kitchen that have maple cabinetry. For instance, to use shades of white like eggshell, antique white and glowing white in order to provide a clean and fresh atmosphere. White color definitely complements the light maple cabinets that you have in your kitchen and it is also suitable for any antique or distressed cabinets as well as country or rustic décor style. Always remember that whenever you want to paint a kitchen with maple cabinets & gold-brown counters, make sure you visit your local hardware store especially at the paint departments. They normally have employees who can assist you in finding the most appropriate color that you need. You can even bring along photos of your cabinets and counter tops. You can seek their advice in choosing which shades that will complement the cabinets and counter tops as well as which color accent suitable for the walls and trim. This entry was posted in Home Improvement on January 26, 2012 by Mike.